PHOENIX, Arizona – Cushman & Wakefield completed the sale of Gateway at Tucson, located at 2800 W. Broadway Blvd. in Tucson. 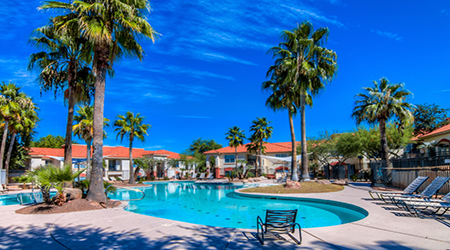 Holualoa Companies of Tucson purchased the property from CW Capital Asset Management LLC of Bethesda, MD for $12.9 million ($68,617 per unit / $23,370 per bed). Gateway at Tucson is a 188-unit, 552-bed, Class A student housing community which offers one-, two-, three- and four-bedroom floor plan options averaging 1,074 square feet. Built in 2005, the property is comprised of 10, two-story residential buildings and two single-story common area buildings. Units are rented fully furnished and each bedroom at Gateway features a private bathroom and a full appliance package. Community amenities including a sparkling swimming pool and spa, basketball court, fitness center, business center, study rooms, tanning bed and shuttle service to University of Arizona and Pima Community College (PCC). Recent capital improvements have been made to the fitness center and study lounge. Gateway at Tucson draws the majority of its residents from the University of Arizona and PCC. The transaction closed November 28th. To learn more, see RED Comp #6376.